Alright, alright, yes this week is Spice Week, and yes, admittedly it is a bit heavy on the Cardamom – which is actually today’s ‘new spice of the day’ as well! (Along with several others!) Today’s new recipe, in which I tried making one of my favorite foods myself for the first time, contained all of these spices. Chicken Shawarma! 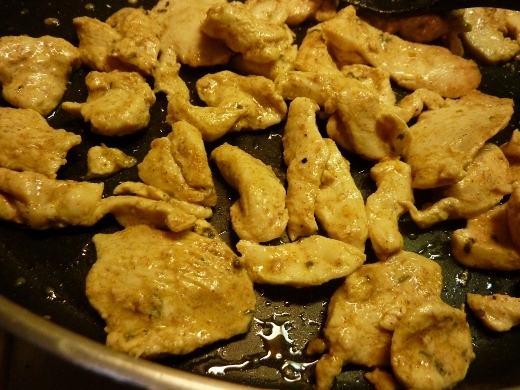 I marinated sliced boneless skinless chicken breast in lemon juice, Greek yogurt, and the above spices for about 8 hours, following this recipe. 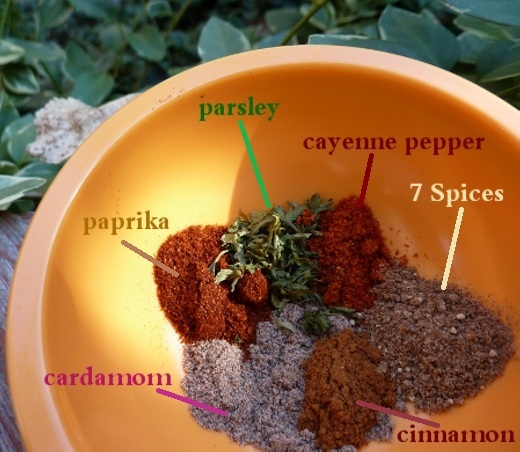 (Note: I didn’t have “7 Spices,” but a found Googled it, and determined that I owned six of the seven spices in this Lebanese blend of spices [allspice, pepper, cinnamon, cloves, nutmeg, ginger…but no fenugreek! ], so I just added a sprinkle of each). So if I did my math right, that’s 10 spices, plus salt! After chilling in the fridge for 8 hours, I arrived home from work and sautéed the chicken in a skillet for around 10 minutes. I served the chicken in pitas, accompanied by lots of hummus, pickles, and tomatoes. Soooo yummy! Now I know mine isn’t exactly authentic – in that, it’s not shaved from a big rotisserie! – but the chicken was tender, and the seasoning was so delicious. 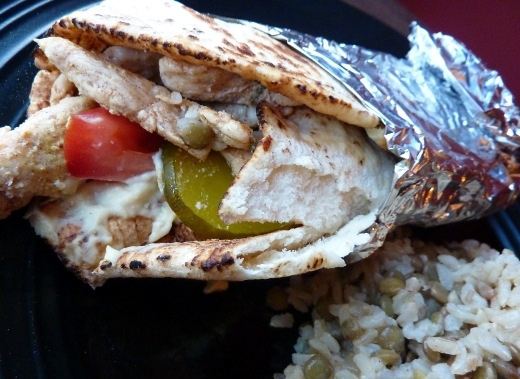 My shawarma wraps were served with mujaddara, or lentils and rice, that I prepared this weekend. Loved this meal! I definitely will make this chicken again, and will make way more, because it was SO good! Oy my goodness, I am watching this miner saga in Chile on TV right now and it is so intense! Hoping for a safe rescue for all 33!